Choose a topic then click on the arrow buttons to hear the words. 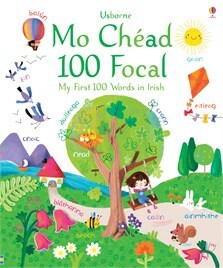 Discover 100 everyday words in Irish in this wonderfully illustrated book. Colourful scenes, labelled in Irish, include a jungle bursting with wildlife, a cosy bedroom and a bustling city street, all beautifully illustrated by Sophie Touliatou. Children can listen to the pronunciation of all the words at the Usborne Quicklinks website.